In the midst of Donald Trump’s controversial nominations to cabinet positions, one particular appointment of more moderate profile came to the public’s attention for other than the usual reasons. Monica Crowley, formerly of Fox News and the Washington Times, was selected in December to serve as senior director of strategic communications for the National Security Council. Beginning on January 9, sources (including Politico Magazine and CNN Money) reported on Crowley’s past writings, revealing unambiguously that she had plagiarized large portions of her 2000 dissertation for Columbia University. By January 16, Crowley had withdrawn from consideration for the NSC post. The plagiarism took the form of enormous passages from published books showing up at intervals throughout the dissertation. The most interesting thing to me in Andrew Kaczynski et al. 's CNN piece is that “Crowley cited these . . . sources in footnotes at various points in her dissertation, but often failed to include citations or to properly cite sources in sections where she copied their wording verbatim or closely paraphrased it.” As Alex Caton and Grace Watkins of Policito put it, “Parts of Crowley’s dissertation appear to violate Columbia’s definition of ‘Unintentional Plagiarism’ for ‘failure to “quote” or block quote author’s exact words, even if documented,’” while other passages appear much more to have been intentionally copied verbatim without attribution at all (para. 7). Crowley has plagiarized in other published works. A column she wrote for the Wall Street Journal in 1999 closely enough resembled an earlier article in Commentary magazine that “a Journal editor said that the paper would not have published her piece if it had known of the parallels” (Kaczynski, Massie, and McDermott, para. 4). Her 2012 book What the (Bleep) Just Happened contains “more than 50 passages” pulled “directly from conservative columns, news articles, Wikipedia and in one case a podiatrist’s website” (Caton and Watkins, para. 3). This is a writer who either doesn’t know or doesn’t care that she’s a plagiarist. If she simply doesn’t care, then there’s not much more to say; she knows what she’s doing, and no matter how many times she gets called on it, she’s probably not going to change. Your dissertation drafts can be poorly written, and it still won’t necessarily mean the end of your career . . . as long as all the quotes and ideas presented in the document are correctly and appropriately attributed. The only mistake you can make that will be a complete dealbreaker (as opposed to a frustrating setback) is not attributing your sources correctly. But here’s the thing. Everyone knows plagiarism is wrong. But I believe a lot of people — whether or not Monica Crowley is among them — don’t know when they’re plagiarizing. There are reasons Columbia's policies recognize "Unintentional Plagiarism": because (1) it happens and (2) regardless of intent, it's still plagiarism. All students at all levels of education are responsible for knowing what plagiarism is. There seem to be, however, some areas of either haziness (in students’ understanding of the rules) or laziness (in their application of them). And academic integrity is just about the only aspect of writing a dissertation or thesis in which being hazy or lazy can irreparably threaten your degree and your future career. To lay it all out as starkly as possible, your dissertation drafts can be poorly written, poorly organized, and poorly spelled, with terrible grammar, messy punctuation, and weak research, and it still won’t necessarily mean the end of your career. It will mean you’ll spend a lot more time on revisions; it could mean you’ll have to pay an editor to get the language in shape; it might mean you’ll run out of funding in the process (if applicable); and if you happen to turn that mess in for your defense, it will mean that you’ll have an embarrassing time of it with excruciating feedback and a call for enormous changes. But there can still be hope for you and that awful paper, as long as all the quotes and ideas presented in the document are correctly and appropriately attributed. That’s right. The only mistake you can make that will be a complete and utter dealbreaker (as opposed to a frustrating setback) is not attributing your sources correctly. All other mistakes are forgivable and fixable. This one, not so much. That should be a pretty low barre, right? I mean, the citations don’t even have to be formatted well to avoid losing your chance at your degree. They just have to be there. Those and everything else that’s wrong with it can be corrected with enough blood, sweat, and tears. And time and possibly money. But turn in a paper with incomplete attributions, and all those resources and bodily fluids will have been a waste of your time. So given that attribution errors are the only problem so critical that they can ruin your career in one deadly stroke, why do they even happen? How is it that any writer would devote less attention to citations than to any other aspect of their work? I really do think that in most cases it’s ignorance, and sometimes it’s apathy. The Crowley coverage can help. Both CNN and Politico offer side-by-side comparisons of Crowley’s plagiarized content and the sources it came from. Crowley wrote her dissertation before plagiarism detection software had become commonly available and widely used, so she might not have expected the paper would ever be scrutinized in quite this way (though it doesn’t explain her plagiarism in the 2012 book). If you're thinking of leaving some direct quotes out of quotation marks because you want to make a few modifications to how the source material is presented — for example, so that it flows better with your own writing (see Crowley’s omission of Gaddis’s “international,” the commas changed to semicolons, and the insertion of “and”) — then check your field’s major style guide for how to do that correctly. A cunning combination of brackets, ellipsis points, and comments in footnotes might make the page messier to look at, but it will keep you ethically in the clear. If it’s because you’re trying to avoid block text (I had one client whose advisor wouldn’t allow him to use block quotes for some strange reason, despite the fact that the thesis was in APA, which has clear formatting rules for them), you can try either of two things. One option is to try breaking the quoted section into smaller pieces with quotation marks around each piece and original text in between. The other one is to go ahead and slap the quotation marks around the quoted text like you would a shorter quote. It’ll be stylistically wrong but ethically right, and style takes a backseat to ethics. If it’s because you’re not sure how to do it properly, look for direction once again in your field’s style guide. I’ve written a bit on this blog about proper use of quotations. Being clear in some way about what words are yours and what words are another author’s is the most important thing — doing that wrong is a smaller problem than not doing it at all. If you have an editor who is authorized (see “Working with an Editor” section below) to style your citations, you can work out a way to show them what material you need to display as quoted. As discussed below, this is a matter of asking your editor or advisor for help on something you know is a personal weakness. Two murky areas have to do with paraphrasing — when it's acceptable and when it's a problem — and the question of how much text from another source needs to be there before you have to put quotation marks around it. Back when I was teaching, students told me things like, “My high school English teacher said if it’s five words or more, it should be in quotes,” though it never seemed as though any two English teachers gave their students the same number of words. Let’s take a look at another excerpt from Crowley’s dissertation. There are two things to look at in the way Crowley treated her source material here that students and other writers should take to heart. First, if no one has ever mentioned to you that it is plagiarism to take a sentence from a source, change the main words with synonyms or related concepts, and then present the entire sentence as your own, then consider this your late but necessary notice: it is. It’s harder to detect than word-for-word transcription, but it’s still the source’s ideas that the writer in this case is presenting, not their own. If that’s what you’re going to do with your source material, then why not simply leave the original sentence as is and quote and cite it properly? It’s ethical and it’s less work. Thesaurus-aided plagiarism is still plagiarism. Paraphrasing works best — and most ethically — when it's used not in the raw presentation of another author's ideas but in the interpretation of them and in the process of giving the author's ideas new and fresh applications. For more discussion on this principle, please see my earlier post on effective use of quotations. Second, “how many word” definitions of what does or does not need to be put in quotes are convenient for high school students and maybe even undergrads, but by the time you’re PhD-ready, you should have a better feel for what should be styled as a quote even if it falls under whatever arbitrary word minimum you were taught. So I’m going to recommend a new benchmark: the Would it look stupid? benchmark. If the word or phrase — yes, it could even be a single word — (1) is a word or phrase you got from your source author, (2) doesn’t look stupid in quotation marks within the context of how you’re using it, and (3) doesn’t look, when in quotes, like you’re questioning the author’s wording or ideas, then put it in quotes. This is basically a better-safe-than-sorry approach that forces you to be conscientious of the context in which you’re using your source. 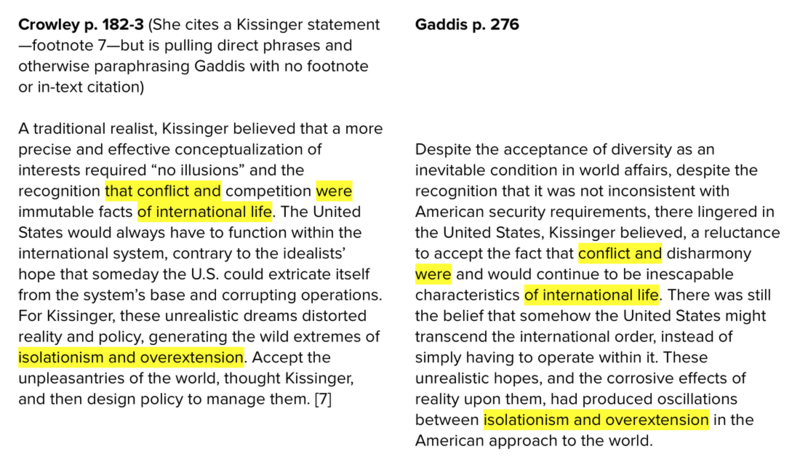 Based on this approach, you wouldn’t put quotes around “of international life” in the Gaddis example, but you would put quotes around “isolationism and overextension” — which isn’t the only mistake Crowley made here, but it is one of them. tl;dr: Editors can often help with citation formatting, but they aren't plagiarism detectors. In most cases, working with an editor on citations really just means the citations: formatting them and making sure they’re complete. You need to be aware of the policies that exist at the institutional, departmental, and program levels and your advisor’s requirements, along with what you and the editor agree that you will pay her for. Under normal circumstances, the editor will assume that all your quotes have quotation marks around them or are (or should be) put in block form. If you know you’re weak in any of those areas, you can communicate with your editor to figure out a way to highlight spots you need help formatting. In other words, you’re not trying to hide any quotes or passages that might not be presented correctly or hope they go unnoticed — you’re explicitly identifying them and asking for help with them. Those are the types of questions and considerations that apply to a “normal” paper with “normal” citation problems. With respect to more significant attribution errors, the main point that needs to be underlined is this: No one has responsibility for making sure your sources are correctly quoted and attributed but you. Your editor might spot problems, call them to your attention, and give you pointers for how to avoid the same mistakes in future drafts or chapters — but they also might not. Editors, like professors, are skilled readers who can sometimes see the variations in tone or voice that crop up in student papers and that raise red flags that some of the text might not be original to the student. But some of those variations are much more visible than others, and if the red flags don’t go up, editors aren’t going to intuitively know that you’ve done an oopsie with your attribution. Furthermore, even if they do locate and fix or query an oopsie — or seven, eight, twenty oopsies — it does not imply they will have found all of them. You, in such a case, need to learn from the comments the editor leaves concerning the found oopsies to correct the ones they didn’t spot. And to not make those mistakes again. Let’s say, for instance, you’re Monica Crowley, and you’ve hired a copyeditor who just happens to have just read one of the books you’ve used as a source. Let’s say this copyeditor recognizes the passages and leaves queries to you, saying, for instance, “Since I have the Christensen book on hand, I checked this passage against p. 248 and found that it’s a direct quote. I’ve enclosed this section of text in quotation marks and updated the footnote. Please do the same wherever else necessary.” The copyeditor has not read Gaddis, Larson, Oye, Milner, and the other authors you (Imaginary Crowley) have plagiarized and obviously hasn't memorized the entire Christensen book, either, so they haven’t made equivalent fixes or even queries. This doesn’t somehow mean that this one Christensen quote is the only one you shouldn’t plagiarize, and it doesn’t mean the editor has failed in their ability to spot problems. Rather, the fact that the copyeditor found even one instance is lucky for Imaginary Crowley because it means she should now know what else it’s necessary to go back to and fix. Crowley and other dissertation writers can’t rely on even that one fix happening. If it does, the writer should think of it as a bonus. Plagiarism of these kinds and others might get by the editor, and it might get by the committee. But if the dissertation gets pushed through plagiarism detection software, whether right away or 16 years down the line, it could mean the end of a career, or at least of all professional credibility. And all because a couple of quotation marks were just too much to type. Caton, Alex, and Grace Watkins. 2017. "Trump Pick Monica Crowley Plagiarized Parts of her Ph.D. Dissertation." Politico, 9 January. http://www.politico.com/magazine/story/2017/01/monica-crowley-plagiarism-phd-dissertation-columbia-214612. Kaczynski, Andrew, Chris Massie, and Nathan McDermott. 2017. "Trump Aide Monica Crowley Plagiarized Thousands of Words in Ph.D. Dissertation." CNN Money, 12 January. http://money.cnn.com/interactive/news/kfile-monica-crowley-dissertation-plagiarism/index.html. I have a confession to make. It shouldn’t be a confession, since it’s actually a positive thing, but so many people hate New Year’s resolutions that I feel a little guilty about it. It’s simply this: I love making them, and they (sometimes) work for me. There, I said it. Some of the reasons I love editing are the reasons I love the New Year: the blank slate; the opportunity to apply completion, pattern, and consistency; the order and organization of a resolution held. And so I thought I’d share my resolution habits, in case they help anyone — not just for resolutions (it’s a couple weeks late or eleven months early for that anyway) but for any other applications they might have. Although I’ve always loved the idea of the resolution, I wasn’t always successful at it, for the same reasons others shun it. It takes self-discipline to start a good habit or stop a bad one, and most resolutions are for things you don’t truly want to be doing; you resolve it because you know you should. It took many years of fiddling with the formula before I found a way to make it work for me (and to figure out why sometimes it already had). This isn’t the same as setting overly ambitious resolutions, but setting all the resolutions I wanted. Now, there are a couple of other guidelines I follow that you’ve heard before, over and over, in every list of ways to be productive ever. The fact that they’re cliché also means they’re time-proven and necessary. The first is making sure your goals are concrete (that is, “Write half an hour every day” rather than “Write more”). The second is making sure to set both shoft-term and long-term benchmarks (such as the writing example for the short term and “Complete a novel by the end of the year” for the long term). I won’t go any more deeply into those because plenty of other people already have. Let’s get straight to the weirder one. I’ve always been ambitious with my resolutions — I’ll usually write down a dozen or so on the last day of the year. But my practice of overresolving-as-strategy dates back to one year when, after doing so, I managed to fulfill every single “Do ________ every day” goal I had set for myself on January 1. I’d gotten up bright and early, met my work target, exercised, cooked, cleaned, read, written trivia, and even practiced the guitar that usually gathers dust in the corner. Everything I wanted to spend every day of the coming year doing, I did. I went to bed with a tremendous sense of accomplishment along with the potent awareness that I was absolutely insane. It was, after all, 2 in the morning; it had taken me 19 hours to do all that. It had never been so clear how much I’d overresolved before because I’d never managed to accomplish everything I’d planned. Instead, I’d finish the day thinking I’d failed at half my resolutions yet again. With the new realization that complete success on these terms was genuinely ludicrous, I began to develop a different definition of failure and success. Over the coming days and weeks, I allowed myself to be a bit more flexible with some of the things I was trying to do. I let most of my resolutions fall away or become much less stringent until I was left with a few I was managing to stick with. The guitar went back to gathering dust, and daily cooking was demoted to twice a week. I let the resolutions tell me which among them I would do 365 days out of 365. When the rest were pared away, I ended up with three completely manageable goals: scooping the litter box every morning, washing all the dishes every night, and maintaining an organized client and project spreadsheet. I kept these all year, and they’ve become enough of a habit that I no longer need to resolve to do them — I just do. The main and obvious question, I realize, is probably Why don’t I just make fewer resolutions in the first place? And I certainly could do that, but what overresolving does, when accompanied by a comfortable paring-down, is let me figure out which ones the sticking resolutions are going to be. If I only made three, and I discovered I couldn’t keep any of them — because those weren’t the resolutions that my current life circumstances had room for — then I’d be left without any improvement in my habits. But setting twelve and then keeping three, without knowing ahead of time which three they’re going to be, allows me to discover my successes. So would this strategy work for anyone else? I honestly have no idea. If you aren’t already one to see the new year as a blank slate and an opportunity for change, then this won’t alter that. But if your brain works as oddly as mine does, and you’re someone who wants to make and keep resolutions but haven’t been able to, then maybe it would be worth a try. I can think of a couple of ways this topic can apply to other situations, though. For instance, if you tend to have a concrete perception of failure and success, it helps to remember that those perceptions aren’t always set in stone. It depends on context, of course, but not all failures are truly objective, and viewing small setbacks as part of the process of success is more often an option than it’s sometimes easy to think. For example, if you’re applying to jobs, it can be easy to feel let down by each and every one that turns you down or that you never even hear from. If you define success more broadly and see the declined jobs not as failures but as steps to the eventual offer, they shouldn’t be as disheartening. Another application is in learning to build flexibility into your goals, projects, plans, processes, and so on. If, for example, you’re writing a dissertation, you may need to stick to a standard intro/lit review/three chapters/conclusion structure or whatever variation on it your advisor prefers. You might even start with a tightly structured outline for every chapter. But that doesn’t mean you need to stick to it if your material is pulling you in a different direction. Writing a dissertation can be a fragile process, and getting the words on the page is more important than having them in the correct order when you write them. As an example of how this applies elsewhere, I see this principle coming in handy when I’m doing my volunteer tech support in Second Life. A lot of the time, people have an idea of what they want their computer to do, and they’re absolutely certain it should do it. They don’t take the time to listen to what the computer is telling them about its capacity to perform. It’s worthwhile to pay attention to your graphics card, to your resolutions, to your dissertation. They may be inanimate objects and abstract concepts, but thinking of them as “communicating” their needs with you is a helpful way to see when you’re applying force where adaptation would be more productive. While I certainly have a lot of room for improvement in the area of productivity myself, I can certainly add my two cents to this pepetually useful topic. The most important strategy is whatever you find works for you. If the strategy of overresolution fits in your bag of tricks as it does mine, then I’m happy to have given it to you. Another popular request from dissertation clients tends to be if they can send their work chapter-by-chapter instead of in one complete draft. The dissertation writing process is very compartmentalized, so it’s normal for you to be thinking of it within that structure, but the editing process is often different, and there are some advantages to shifting to a full-draft perspective when the time comes. Some editors will be perfectly fine with separate chapters, while others will prefer to receive the document in one piece. Style editing. When copyeditors edit, they’re often making a list (called a style sheet) of universal changes they’re making in order to make sure they’re making the consistent choice throughout the document. It’s not unusual for a style choice made at the beginning of a lengthy document to prove problematic by the end. If they have the whole document in front of them, they can make the late change relatively easily to the earlier chapters. If they’ve already returned those chapters, then they’re forced to stick with the less-than-ideal style option. Say, for instance, there is a term you use both hyphenated and unhyphenated in the first chapter. The editor will pick one of those variants (for example, the hyphenated one) and make all instances consistent. Then she might receive your later chapters and discover that by the time you wrote those, you became more consistent with your own usage and used the unhyphenated version of the same term. If the editor had the entire draft from the beginning, she would have had a broader perspective on your use and chosen the unhyphenated variant. Formatting. In addition to APA formatting, which some departments require, graduate schools have very specific requirements for dissertations that include pagination, margins, organization of front matter and back matter, placement of tables and figures, and sometimes headings, fonts, and other details. Much of it can be accomplished more easily with a complete draft at hand. Citations. One of the things an editor can do is cross-check your references with their inclusion in your reference list and vice-versa. This task requires both the reference list and the chapters be present. Although this can be done chapter-by-chapter, as well, it will be a speedier and easier process (and thus cheaper for you) if the editor has everything in one place. All of the above are aspects of the editing process that can be done more easily and more speedily with a full draft than individual chapters. It’s not always a huge difference, but across 200 or 300 pages, it can add up. While many editors may be open to working chapter-by-chapter, the difference in the process is likely to affect you at the pocketbook end. If you don’t expect to be finished writing the entire dissertation until a week or two before it’s due, then your editor would probably rather work on the chapters you’ve completed than wait until the last minute to have the full draft. But again, this is a matter of preference, and it’s best to confer with them early on this. Some might want the entire draft early and fully.